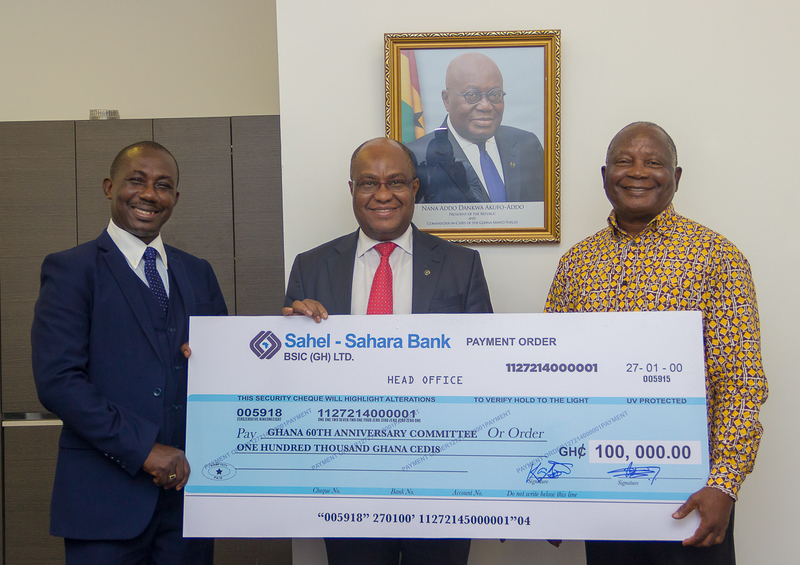 Sahel Sahara Bank has presented a cheque of GH¢100,000.00 to the Ghana@60 Secretariat at the Flagstaff House, Accra. Ghana marks its 60th anniversary in a couple of weeks. At the launch of the celebrations, President Nana Addo Dankwa Akufo-Addo called on the private sector to finance this venture at a cost of GH¢20million. It is in response to the call by the President that Sahel Sahara Bank, led by its Managing Director, Mensan Adeboke Affambi, made the presentation to the Secretariat, last Friday, 17th February, 2017. “We are here in response to the call made by the president to support Ghana’s 60th Anniversary Project. We see the support of this initiative as part of our core principle in the exercise of our corporate social responsibility” he said. Deputy Managing Director of the Bank, Dr Kojo Aboagye-Debrah, added that Sahel Sahara Bank has seen steady growth since it entered the Ghanaian banking space in 2008 and is poised to achieve more laurels than it has over the past nine years. “We have been here for almost a decade and steadily we are leaving our mark everywhere we go. As a bank that supports investment and commerce we have been facilitating trade across the continent and beyond for years,” he said. Dr. Aboagye-Debrah explained that BSIC Ghana which also trades as Sahel Sahara Bank is part of the BSIC Group. The Group was formed pursuant to a convention signed in Tripoli by Heads of States of the CEN-SAD community in April 1999. It has affiliates in 14 countries on the continent made up of 10 Francophone, two Arabic and two Anglophone countries. The main objective of the Group is to eliminate geographic and language barriers among CEN-SAD states by promoting trade and investment in Africa. Ken Amankwah, Chairman of the Ghana@60 Planning Committee, thanked the bank for supporting a national initiative. “We are happy to receive you and appreciate your support for this celebration,” he remarked.